SACRAMENTO REGION, CA (MPG) - SMUD’s high voltage transmission lines in the Sierra deliver large amounts of power from SMUD’s hydroelectric facilities to customers in the valley. A fault on one of those lines can significantly impact the electrical system, potentially leaving thousands of customers in the dark. Critical to the lines’ capability are splices that enable the lines to be continuous. As transmission lines are strung or repaired over time, the splices, which are tubular sleeves, can degrade. To find potential faults SMUD is using state-of-the-art portable X-ray photography to inspect major transmission lines that feed the SMUD grid. Since the X-ray data collected is live, any potential issues are found immediately and repairs are promptly made to arrest future failure. These high-voltage lines are strung atop high lattice-style towers. 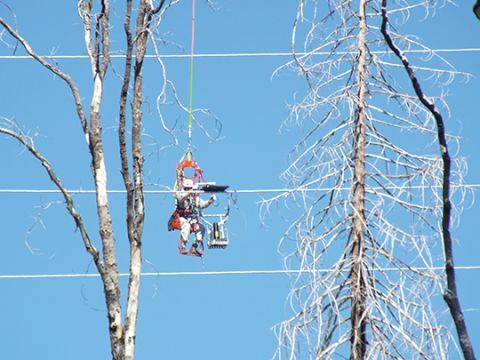 Maintenance and repairs on them can involve a lot of work, sometimes more than a hundred feet above the ground, and the work is typically done while the lines are energized so power can flow without interruption. To do the X-ray inspections that see inside the critical splices, they brought in lineworkers from Western Area Power Administration (WAPA), who are certified to do what’s called “barehand” work on energized transmission lines high above the ground while suspended from a helicopter. Barehanding is a technique that safely allows transmission lineworkers to “bond on” and have direct contact with energized, high-voltage lines to perform work. Special protective clothing, including gloves, socks and boots, place the lineworker within the field of electricity that surrounds the energized conductor, allowing the electricity to flow around their body. The work is part of many ongoing projects to improve and enhance reliable power delivery. The transmission lines in El Dorado County enable SMUD to deliver power from the Upper American River Project (UARP), SMUD’s huge system of hydroelectric power plants in the Sierra. The UARP’s nearly 700 megawatts of clean power can provide about 20 percent of SMUD’s power in a normal water year, which can be crucial especially in summer months when market power is more expensive. Reliability is a core value of SMUD, a policy set by the SMUD Board of Directors who is elected by SMUD customers. To fulfill that policy, SMUD continues to bolster the infrastructure that comprises SMUD’s grid. For more information about SMUD, visit SMUD.org.